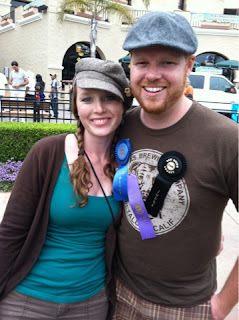 Last Sunday brought the annual San Diego County Fair home brew competition with an incredible 1,242 entries in all 28 of the BJCP categories. (2 of the categories were split into subcategories so there were a total of 30 categories) Liz and I judged the IPA category (our second time judging at the fair and first time judging since taking he BJCP exam). The common experience most of the judges had was a lack of hop aroma in most of the beers, which was surprising for San Diego brewers - lack of hop character in general is not a problem. 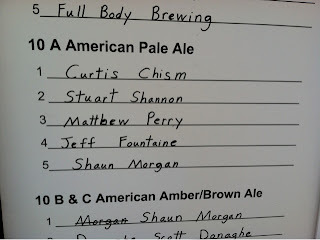 Our Pale Ale (originally brewed 4 months ago as an IPA) ended up taking 1st Place in the Pale Ale category! We were completely shocked, having never expected to win in this category which had about a 100 entries in this category alone! 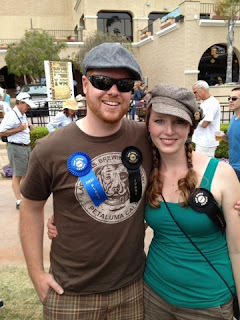 All the 1st Place entries (30) were then placed in a Best of Show round, which had a BOS winner and 4 Honorable Mentions. 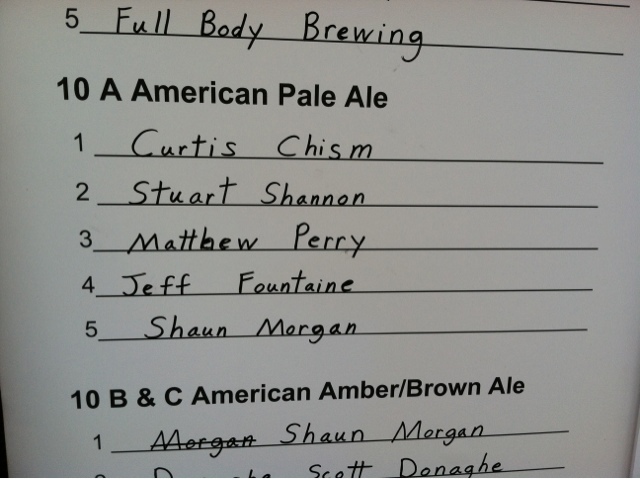 Our Pale Ale took Honorable Mention, placing it in the top 5 beers of 1,242 beers! The Pale Ale was a simple recipe with 2 row, Crystal 40, Munich, a little sugar, and Cascade/Centennial hop additions. It was stored for 4 months at room temperature. I actually planned on entering another beer I brewed specifically for the competition and then "discovered" this beer in the closet (having forgotten about it). I did a side by side comparison and decided to enter the "aged" beer instead. Sometimes it's better to be lucky than good! This is right after getting our 1st place ribbon. And clearly we're really happy after getting Honorable Mention for Best of Show! Dude! That's awesome news! Congrats! That sounds really tasty, I dig the "aged" pale ale term. Good times! Yep, my guess is most people just need to brew closer to the competition date. I didn't get to try the winning beer in the category (there were 10 judges and once we'd judged all the beers, 2 stayed to pick the top beers).